I posted a make up collection back in the early days of this blog, we’re going back a couple of years! I did look over it before I wrote this updated collection, mainly to see how my collections grown. If you would like to look at some shockingly poor quality photos you can see my old collection here. Anyway onto the good stuff.. 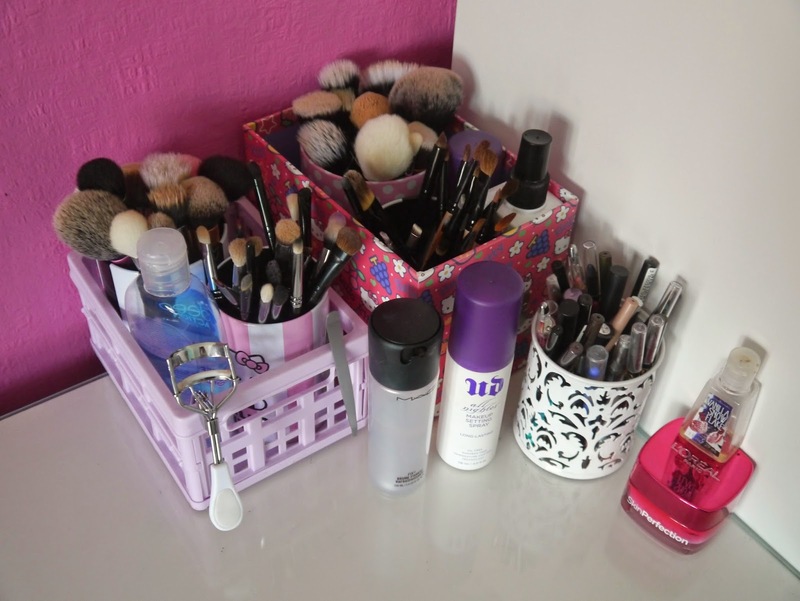 I started my collection with a make up bag, then some plastic drawers, then acrylic drawers and now I’ve finally upgraded to the Ikea Alex 9 Drawer (I’m a true blogger now!) I’m sorry about the pictures I took them as it was getting dark so the light alters. 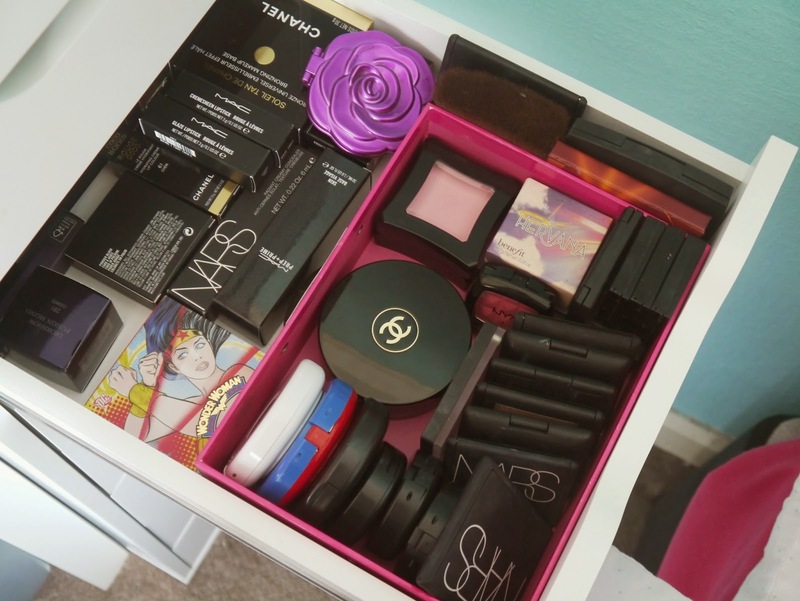 I do own a fair amount of make up, its nothing compared to most bloggers/youtubers but what I do own I like and use. When I find a product I don’t get along with I find it a new home normally with my mum or sister. I also don’t go out clubbing, smoke or anything like that so any money I do have I like to invest into make up as this is the industry I’m going into. I have a MAC Pro card so I do get a discount and some of the items have been sent to me to review so I didn’t purchase them. Sorry for rambling but everyone does that disclaimer before they begin. This is my brushes/setting sprays/eye liners kinda corner. The brushes are mainly Real Techniques, MAC, Zoeva and Coastal Scents which I store in Hello Kitty tins I found in TK Maxx. I also have my favourite setting sprays, MAC Fix+ and Urban Decay All Nighter which are must haves for me! The white pot (from Wilkinsons.. 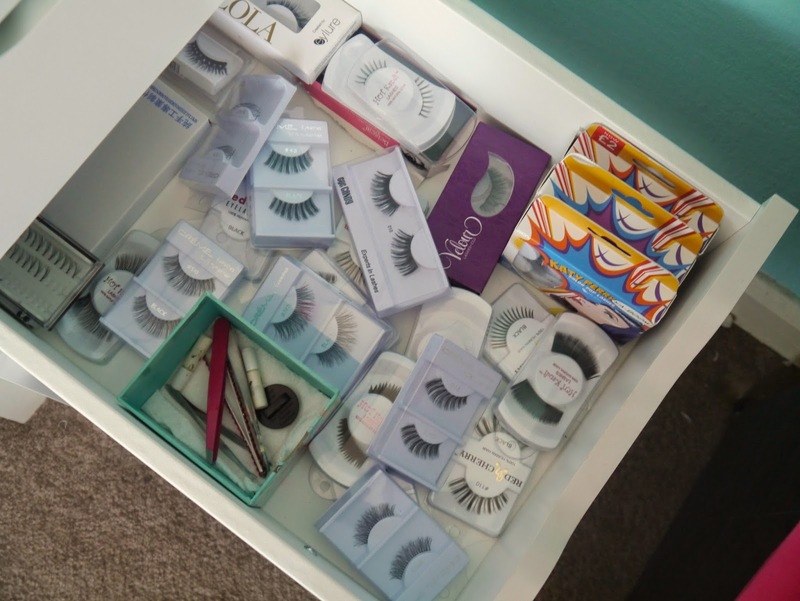 I think) stores my eyeliners which are mostly all Stila, Soap & Glory, Urban Decay with a few NYX and Barry M ones. I also have my L’Oreal moisturiser and a hand sanitising gel. The first draw is lips. I keep all my lipsticks, glosses, balms, crayons, stains and everything else lip wise. My favourite lipstick brand is easily MAC, I have a weakness for that sleek black packaging, and I also got my hands on a couple from the Kelly Osbourne collection and oh my that purple packaging is heaven! The lipstick holders are from eBay which I can’t find a link to any similar, they have 24 slots and are flat made of a thicker acrylic, I think they where about £10 each. The boxes are from old storage drawers from WH Smith. When I swapped my storage around I ran out of room for lipsticks so I decided to depot some of them into the Vueset 24 section palette. I depotted most my drugstore lipsticks, like Barry M, Collection, Topshop, Maybelline and brands like that. Unfortunately I lost the slip of paper that I wrote the shades on, so which colour is which is anyone’s guess. It took about 4 hours for me and my sister to melt all these down, but it’s worth it as its so space saving. Draw number 2- another favourite of mine! This is my palette draw. It is layered up with my most used palettes being on top. My favourites are the Urban Decay Electric palette and the Stila In the Light palette. I also really love my Nars One Night Stand palette which was limited edition and hard to get hold of now. I got this as one of my presents for my 18th birthday so it’s special to me. At the bottom I have my pink Z palette which holds shadows from random palettes that took up too much space. I also have my MAC quad which doesn’t get much love. This is my pigment/single shadow/paint pot/colour tattoo drawer. 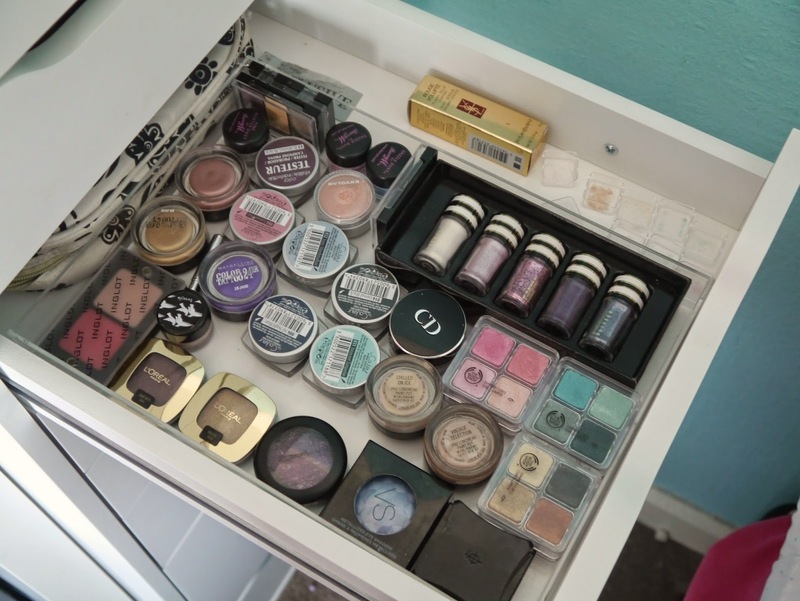 I also keep my Body Shop Shimmer Cubes and Inglot Duo in here. I don’t tend to reach for this drawer much as I do prefer palettes as they’re more convenient and I guess I’m lazy because I’d rather reach for one palette with all the colours instead of scrambling through single shadows. I do use my MAC Vanilla pigment a lot as I find it such a lovely colour to work with. It’s permanent but I got it in a limited edition holiday set last year with 4 other pigments as well. The inside is an acrylic drawer from a acrylic paper sorter. 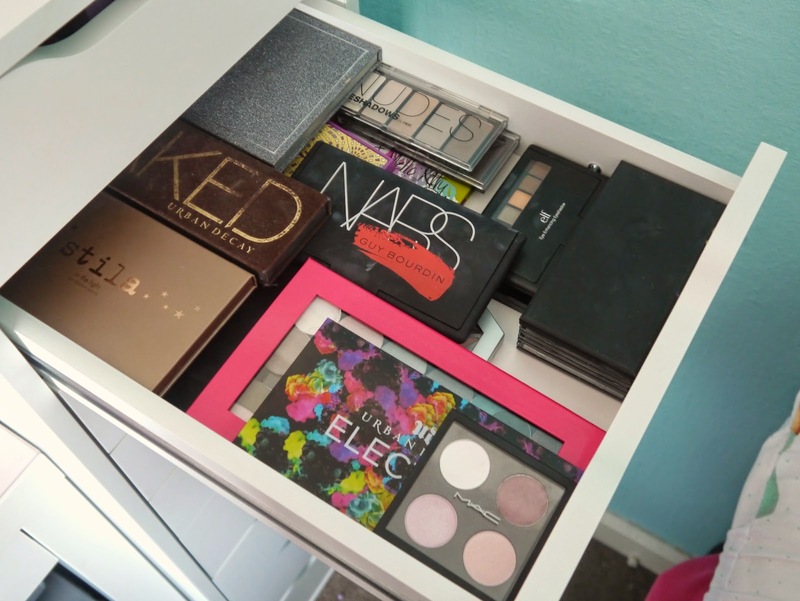 Next up is my blush/bronze/highlighter drawer. These are mainly MAC, Nars, Illamasqua, ELF and Sleek. I also have my Chanel Bronze Universal which has the nicest looking packaging ever, as for the colour is a bit orange for me.. I’m trying to love it as it cost so damn much. In the back is some packaging from recent purchases or limited edition packaging I like to keep. I like to think they’re just my ‘back ups’ but in reality who has the money for back ups of every product? Certainly not me. The cardboard drawer is from the WH Smith set I mentioned earlier. This is my random drawer, it’s an organised mess and I know what’s where but to anyone else this probably looks a mess. 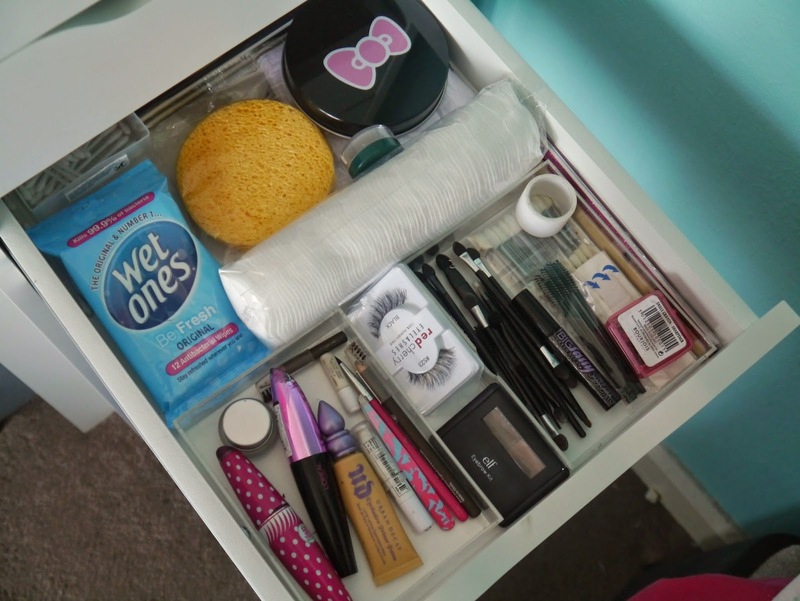 I keep wipes, tape, disposables, mascaras, gel liner, brow products, my favourite lashes, sharpeners, plasters, cotton pads, cotton buds and a load of those sponge things that come with palettes that nobody uses. I find they come in handy when I’m doing special effects. 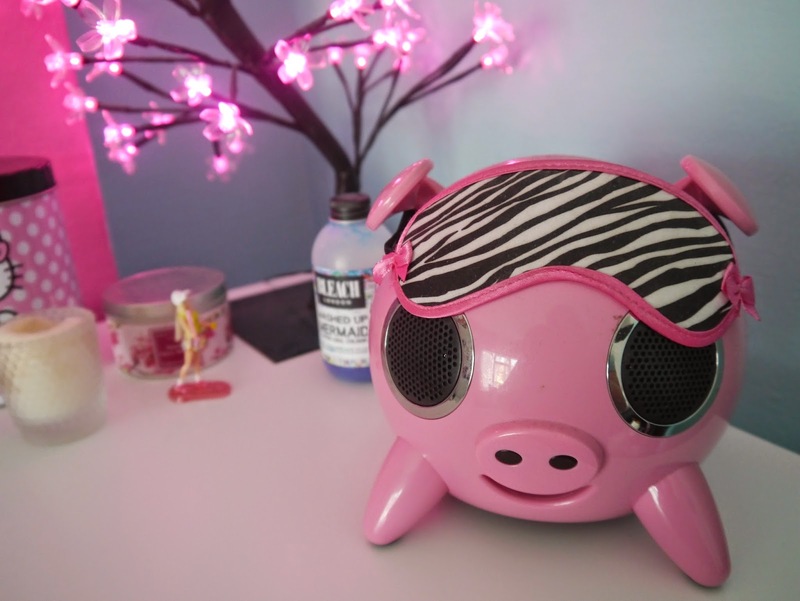 I also keep my face paints and sponges in the back which aren’t shown in the photo. 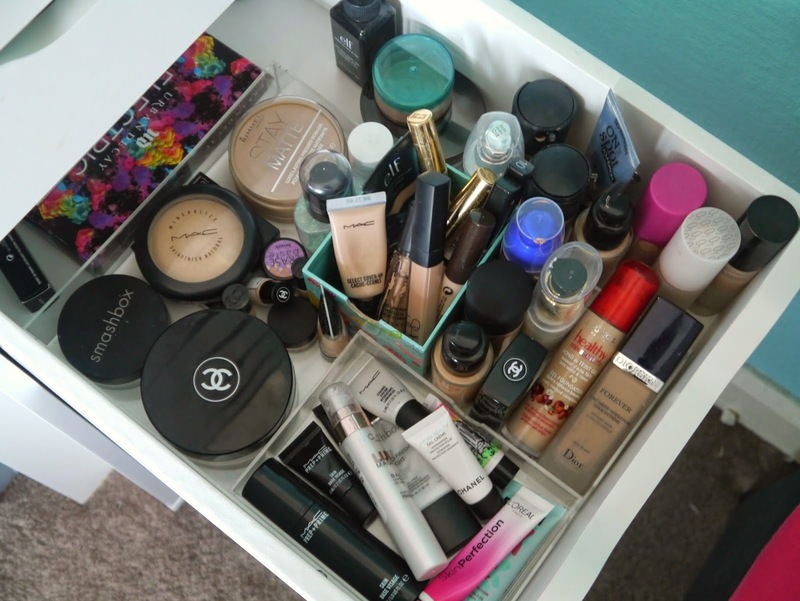 This is another favourite drawer, I store my foundations, concealers, powders and primers. My favourite foundations have to be MAC Studio Fix, Benefit Hello Flawless and Boujois Healthy Mix. I have a lot of foundation samples as I always test out samples before purchasing the full size product. I don’t have many powders as I’ve found these ones to be the best for my skin. Rimmel Stay Matte is a must if you have oily skin. I keep them separated in various different sized acrylic drawers. 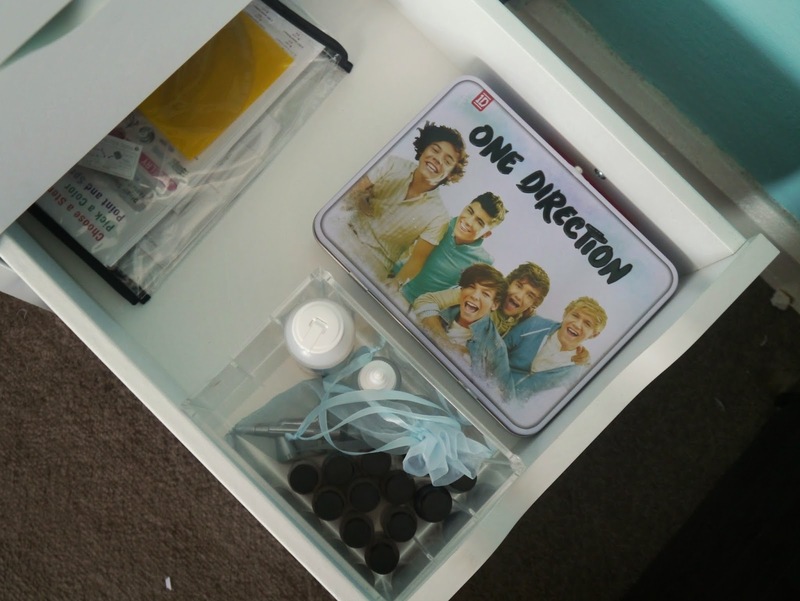 This drawer is pretty boring, I just keep my Dinair Airbrush Machine in that overly cool One Direction tin. I got this for Christmas and to get it to the UK after upgrading the kit to a different foundation it ended up costing about £300 which was totally over priced. I don’t get along with the foundation which is a shame, I’m still going to keep on trying it. The customer service wasn’t very polite or helpful so I don’t recommend the company. Final drawer- if you’re still reading you deserve some kind of trophy.. actually I’ll send you a virtual high five through the computer screen! 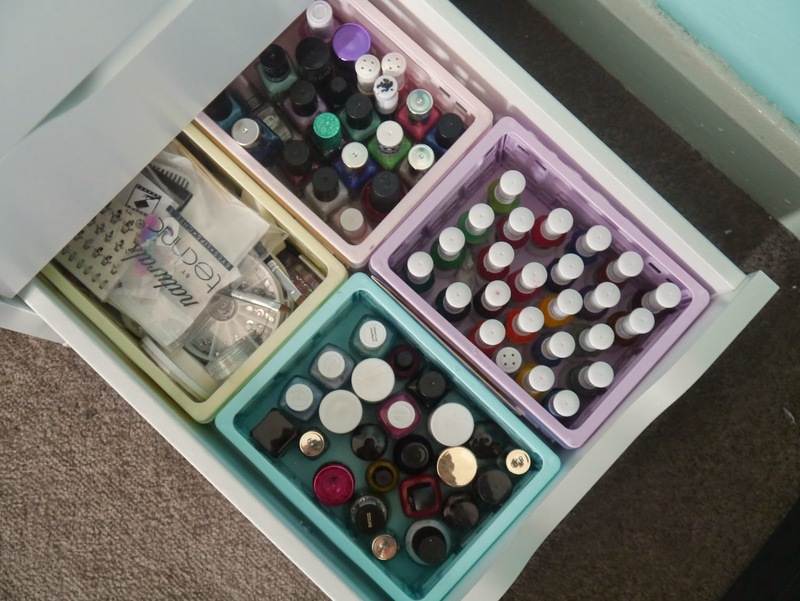 This is my nail varnish and nail art drawer. I keep my most used nail varnish’s on the shelves in the corner behind my desk so these are the rest of them. These are more colours I don’t use because I have blue hair I get really conscious about making sure my hair and nails don’t clash. The baskets are from Hobbycraft and they where only about £1 each. They come in different pastel colours which I really love.